If you’re a berry lover then prepare yourself to be amazed! 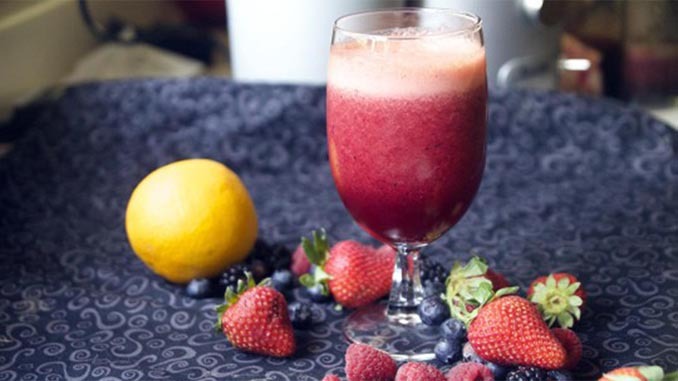 This fast and simple orange berry detox juice recipe contains a handful of different berries that are going to taste mind blowing once you’ve combined them all together! But, before I jump into the recipe I wanted to quickly note that this drink is great for the morning time. If you want something healthy to drink on your way into work then consider this juice. It’s full of berries, vitamins, minerals, nutrients, and antioxidants which are all great to get you going early on! The orange will add some sweetness as it makes for a great base, and the cranberry juice should be pure to get the most benefit from it. Try making it at home today! 1) Wash all produce first. After you’ve completed each step in the directions above your orange berry detox juice should be finished and ready to drink! The ingredients above will make one serving and the total preparation time is only about 10 minutes. You may also want to consider making multiple servings one day and then storing them in your refrigerator for quick grabbing in mornings throughout the week! I think I need to buy a juicer. This sounds like a good drink to have. I was wondering how many calories are in it.